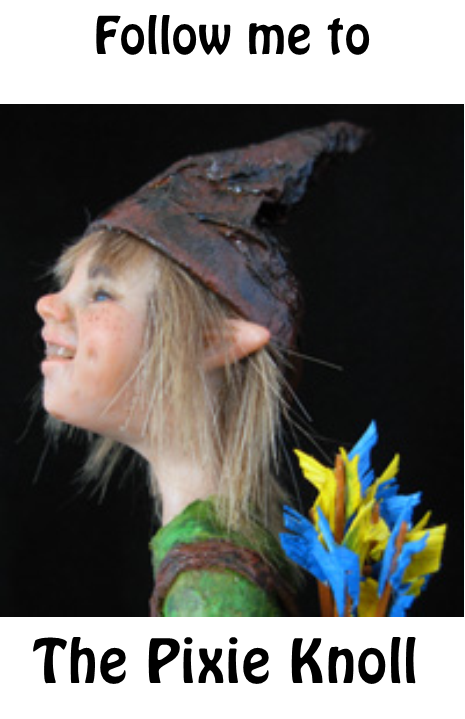 Discover the tales from the dark side of The Pixie Knoll. The inhabitants here live beyond the world of the Knoll. Their homes are along the moors and swamps, they lives in caves and caravans. They are not bad beings. Their teachings are earthbound and their knowledge is ancient, as old as the ground itself. These are the mystics, the seekers, and the ones of ancient wisdom. These beings are the witches, gypsies, crones, dark pixies, and mystics of the land of The Pixie Knoll. Hello there Ghouls and Goblins! Anyway, after much thought, and too, with the way this year has gone for me in my personal life, I have decided that trying to keep up 2 blogs with "separate identities; i.e. Coven of Crones" has been a bit much for me. 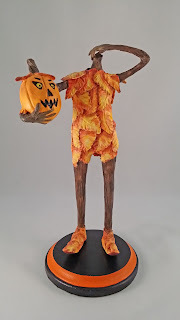 As a result, I have decided to keep everything under "The Pixie Knoll" name, which from here on out will be "The Pixie Knoll Halloween" for my Halloween goodies. 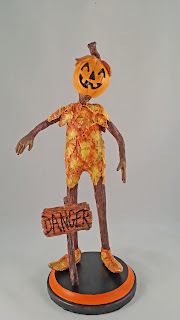 That is to say, I am NOT discontinuing the Halloween themed art by any means. It just means that I am keeping it all in one place to make it easier for me to manage. If you disagree, feel free to send me a message saying so, but, unless I have a mad, angry mob with pitch forks and fire beating down my front door, this is how it will have to be from here on out. Yes, I admit, I think the Coven of Crones title was a lot of fun, but, it was good while it lasted and in truth, we don't need a bewitching title to have spooky fun. So, from this day forward, my post will be under "The Pixie Knoll" blog......just with a slight twist. :-D I do hope that all of you understand my decisions behind this. It just simplifies things a bit for me. Especially since I was double-posting all of my Halloween themed items anyway. This will free up some time and permit me to do the thing that is most important....creating wonderful items for you, the collector! So, as titled, "Ashes to ashes, and dust to dust" Perfect for the Day of the Dead. 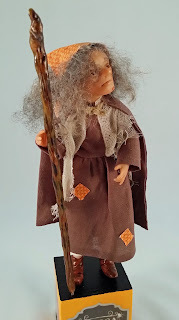 And, for this final good-bye for the Coven of Crones blog, I leave with some pics of items that are still available on my website and Etsy store, along with a few items that I had with me at the Spirits in Sanford show this year. And, remember, this isn't "The End" as in gone for good....it's the fiery phoenix out of the ashes....rebuilding into something better for all! The Pixie Knoll: Halloween! Thanks for understanding my dear friends. And, now...the photos! Enjoy! 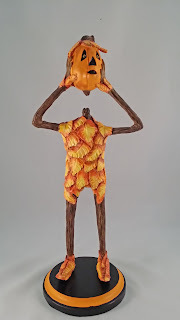 Pumpkin Goblin figure available in Etsy store! One of the many witches available in my Etsy store! Swamp/Gypsy witch available in my Etsy store! 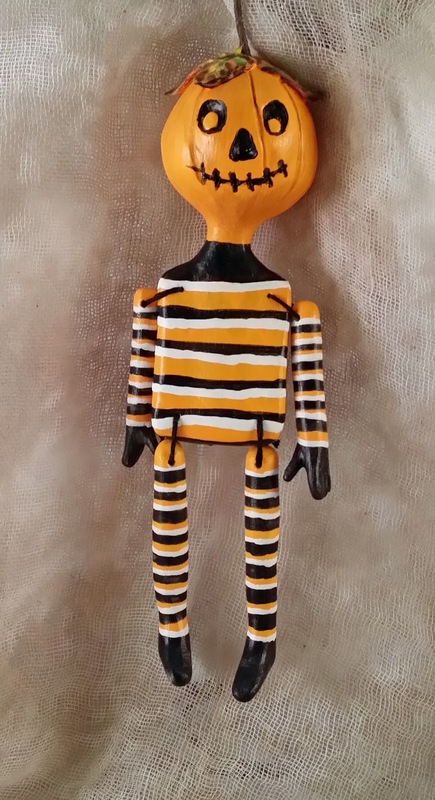 You will find many pumpkin ornaments in the Etsy store! 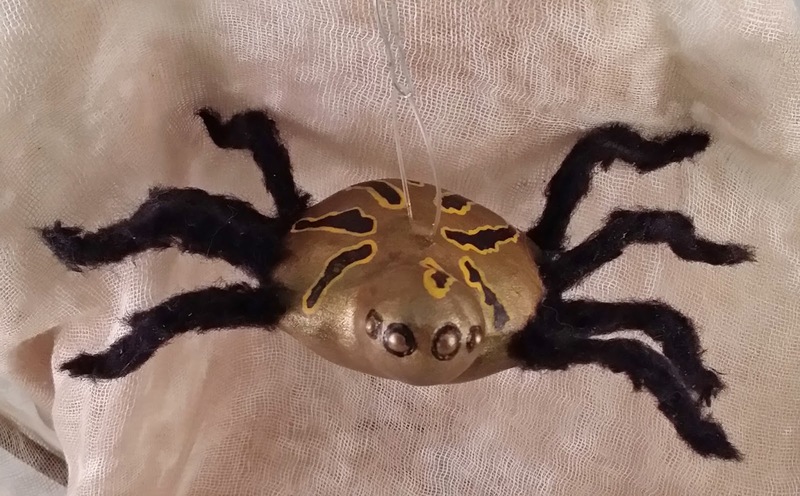 Also there are spooky spider ornaments perfect to hang on your Halloween tree! 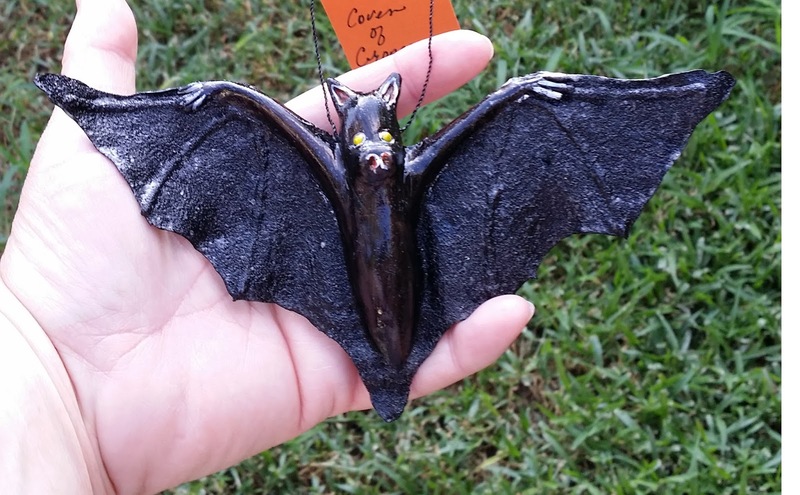 What tree would be complete without some blood-sucking bat ornaments? Find more in the Etsy store! 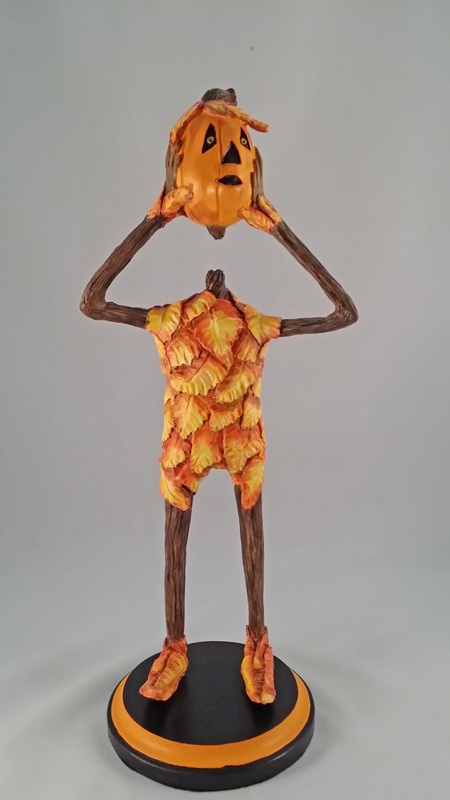 This Pumpkin Goblin figure SOLD at the Spirits in Sanford show! 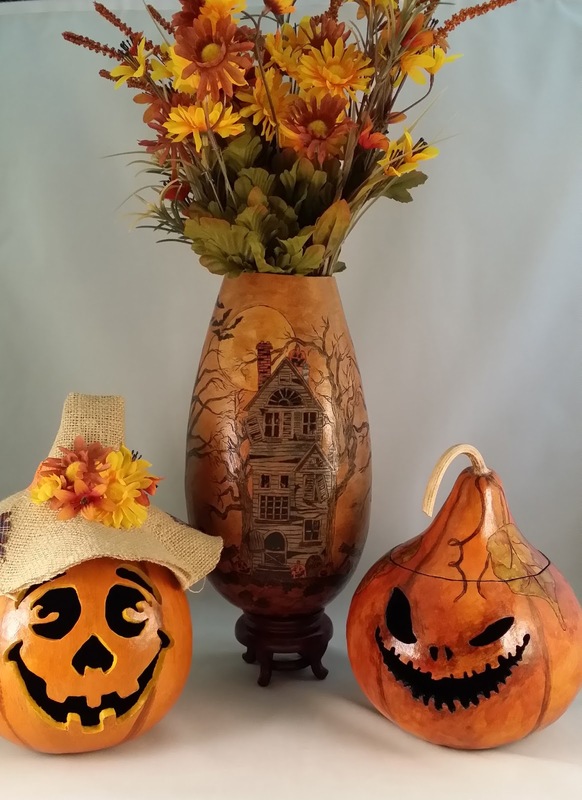 Gourd candy bowls. These SOLD at the show. Aren't they wonderful? 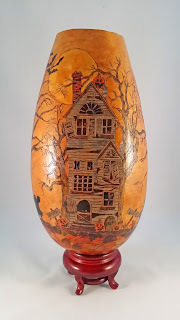 This "Haunted House" gourd vase also SOLD at the show. 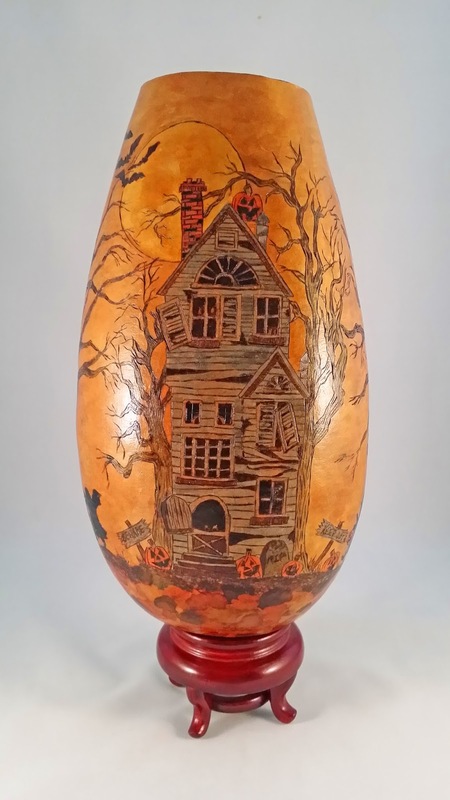 It has imagery all the way around the gourd for a continuous scene of trick-or-treaters going and coming from the haunted house. It was AWESOME!! Again, I want to thank all of you for following along here at what was formally called "Coven of Crones". You have all been wonderful to me. I do hope you CONTINUE to follow me at "The Pixie Knoll" blog where I will post all year long....and HALLOWEEN too! So, be sure to follow along there as I have been on that blog for a LOOOOOOOONG time. Thank you all for understanding this need to change. I appreciate it. Happy Day of the Dead to everyone! Happy Fall, Y'all! A Big Sale In The Etsy Shop! Aside from this news, I must apologize that I have not been here to make any new postings of late. 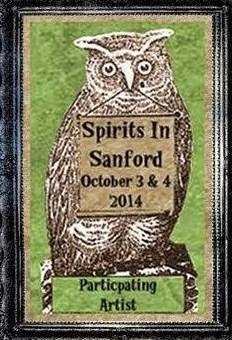 The truth is that I have been working my fingers to the bones trying to get ready for the Spirits in Sanford show that is coming quickly around the corner on October 9 and 10th, 2015. Along with that, unfortunately, life has been getting in the way with my son being sick in the hospital with pneumonia, pleurisy and cellulitis from an abscess on his elbow and me dealing with a horrid sinus infection issue that has finally sent me to the ENT to get some relief. It is amazing how crippling sinus pressure can be when it feels like you have 10 tons of bricks sitting on your face all the time. I can barely focus because of it! Fortunately, I bought stock in Tylenol sinus and that held it at bay long enough for me to get a few things completed! At any rate, enjoy the Happy Fall sale! I hope you find yourself something special to take home with ya! The Settling of Grave Dust.....WIP pics!! 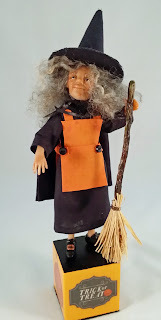 It's been a whirl wind of activity at the Coven of Crones and finally, some of the dust is starting to settle so that I can see what direction I am heading! Anyway, I wanted to give all of you ghouls an opportunity to see the progress I have made thus far. Last time I left you with a snap shot of some "heads". 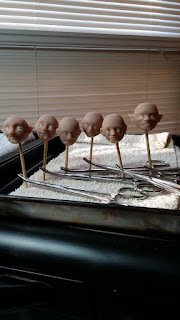 Nothing wrong with heads on skewed pikes when it comes to Halloween WIPS. haha In fact, it's kind of befitting if you ask me. But, before I bombard you with all of the fun WIP pics, I wanted to give you a small bit of news first. 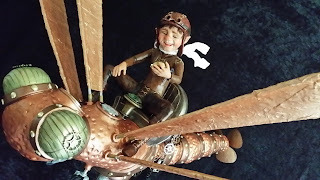 Back in June, I received the prestigious 2015 Dolls Awards in Excellence from Dolls Magazine for my recent finished project "World Traveler" out of The Pixie Knoll. It is now time for the public to do their part in voting. That's right! You, the PUBLIC get to cast your vote on your favorite doll artist's work. Granted, I know, it's not all about Halloween, but, these accolades add up and in return make the work you collect even more valuable over time. Each award that an artist receives is a prestigious knot in the noose in the doll artist world and this "hopefully" increases the value of the work for the collector and artist alike. So, please take about 5 minutes of your time and vote in the People's Choice Award. At the end of the ballot selection, you can then "write in a name" on the ballot of your favorite doll artist for an extra award. Of course, you will see my name listed there, Lori Platt The Pixie Knoll. The website link to do your voting is www.dollsmagazine.com Here is a pic of my piece that won an award: "World Traveler"
"World Traveler" a close-up view! Ok, now that we have that little tidbit out of the way, I wanted to show you the WIPS now of all the Halloween goodies I have in the works. 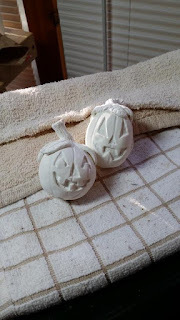 The first set, you will remember the 2 little pumpkin heads I showed you earlier. Well, the pumpkin patch grew to a total of 6! Not only that, they can get up and run a muck to cause all sorts of troubles...well, almost. LOL They are not quite finished. 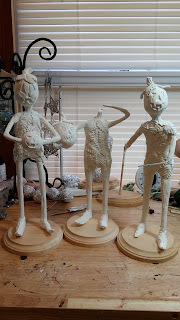 I still have more sculpting to do on some of them. I would guess they are about 12 inches tall. Then, of course, I need to paint. 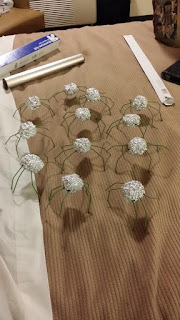 But, here they are so far! The second set of pumpkin people! I'd say they are shaping up nicely. 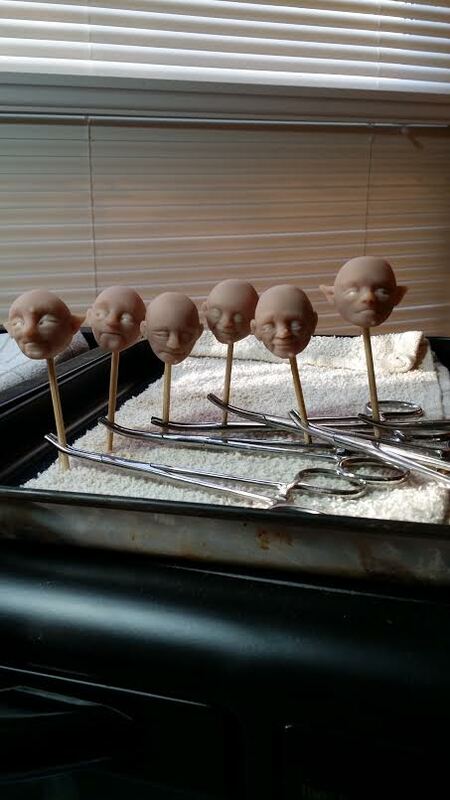 Now, we have the tiny witch heads. There were 6 of those from the beginning. All different and unique. 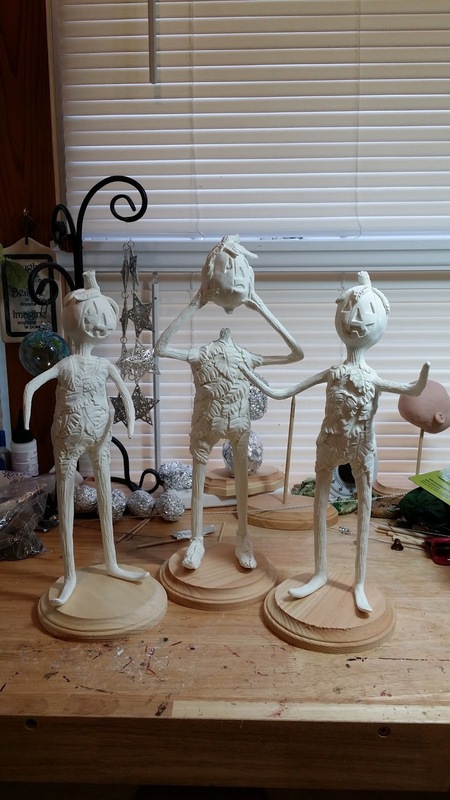 These figures are all about 6 inches tall, not counting the wooden block base. That makes them about 7-8 inches tall in total. I still have quite a bit of work to do on these too. But understandable, there are a lot of projects in the works so you have to expect this kind of thing. :-P As a side note, there are 2 figures in this lot that will be pixie witches, and the other are typical crones. All will have their broomsticks except for the pixies which will have staves. First set of 3 witches in the works. 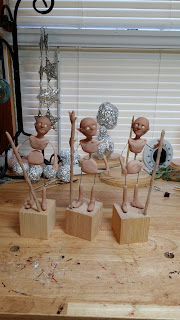 2nd set of 3 witches in the works. And, then, finally I leave you with a snap shot of an "upcoming project" in the near future. All I can say is that it will be a doll.....and it will contain pyrography. 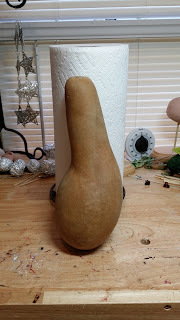 Once I complete the first projects, I will be working on this gourd, so stay tuned! Anyway, I've got lots of work to do as you might have guessed, so please, drop me a line if you wish, leave a comment here or by the new email. I hope all of you ghastly people have a spooktacular day! 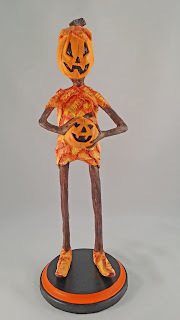 I just wanted to jump in here to let you know that my next upcoming show is at the Jeanine Taylor Folk Art Gallery in Sanford, Florida on October 9 and 10, 2015. The champagne reception and preview party begins on October 9 from 6 - 8 pm. (And YES, costumes are allowed! So please dress up to add to the spooktacular fun!) The preview reception is by RESERVATION ONLY, so please call 407-323-2774 or email info@jtfolkart.com. The $20 fee includes gormet hors d'oeuvres, first look and early buy, plus entry to the show on Saturday as well. The Saturday show is open to the public from 9 am to 3 pm with a $5.00 admission fee. For more information regarding the event and the location, check out their website at www.spiritsinsanford.com. But, before I show you the ingredients that are going into the cauldron, I want to make a quick announcement. Last week I attended the International Doll and Teddy Bear show in North Carolina (IDTS). 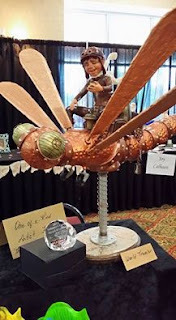 While I was there, Dolls Magazine announced that I had received one of the 2015 Industries Choice Awards in Excellence for my piece "World Traveler"! What an honor to receive this award AND....it's my 3rd year in a row to receive one of these prestigious awards!!! At any rate, here is the winning piece with his award next to him from when I was at the show. It is such a delight to be able to share this happy news with all of my collectors out there! at the International Doll and Teddy Bear Show in North Carolina, June 2015. 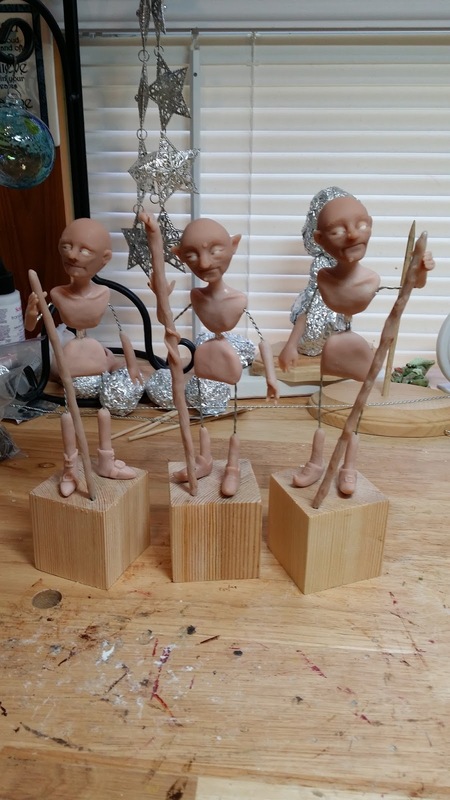 Little Mini Witches......stay tuned for bodies! Cool pumpkin guys in the works! So, while I'm toiling over my boiling cauldron with all these ingredients, I hope that all of you have a super great night. Be sure to check back in at the Coven of Crones to see these nightmares completed! I realize it has been a while since I have posted on this blog. It has not been intentional by any means so please allow me to explain. For those that do not follow The Pixie Knoll blog, I wanted to give you all a brief update as to my whereabouts over the past few months. In November, my mother started to become ill and finally ended up in the hospital in December. When she was released from the hospital ICU a few days prior to Christmas, she came to live with me while she recuperated enough to return to her own home. Unfortunately, she never did make a full recovery and in March, she was once again admitted to the hospital where she stayed in ICU for a total of 5 weeks until she passed away on April 27th. 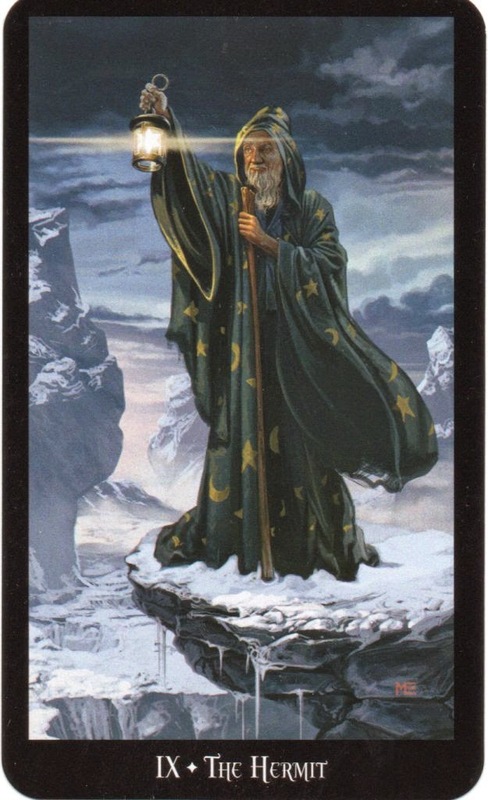 The Hermit card from the Witches Tarot. 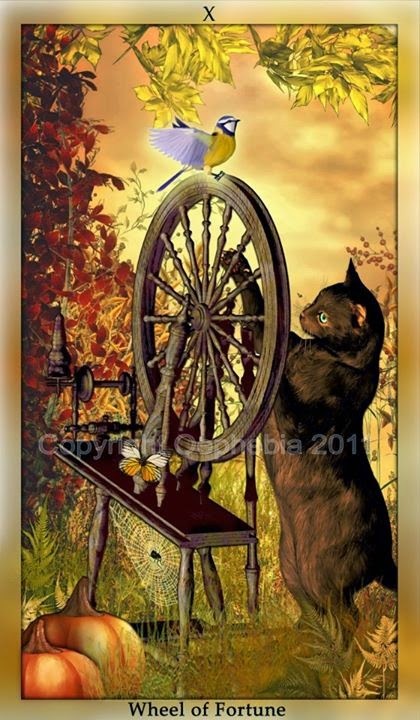 Wheel of Fortune by Oephebia of Animalis Arcanum Tarot. In the meantime, while I am seeking my creative voice for all things spooky, I am wondering how you good folks feel about Tarot? I had once considered doing a "study" of them. The idea is to basically feature one card a week and try to pick it a part to find all of it's hidden meanings. 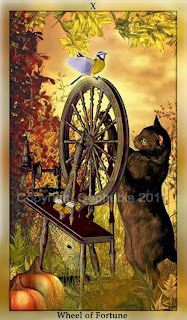 In doing so, this would broaden our horizons in the mystery of tarot. What do y'all think? Interested? Let me know! 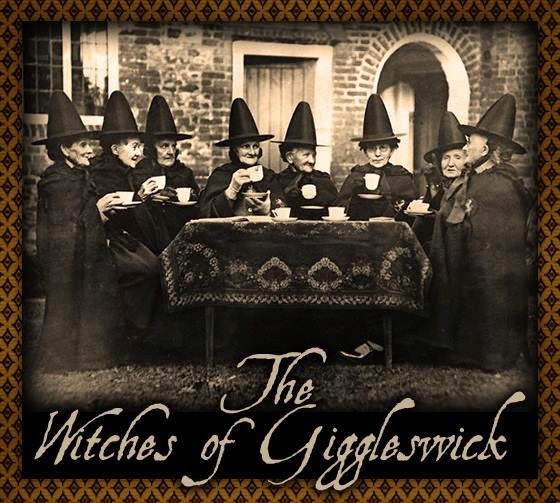 As a final note for this post, I also wanted to make mention that I am now also affiliated with The Witches of Giggleswick community on Face Book. https://www.facebook.com/pages/Witches-Of-Giggleswick/1438375269725632?fref=ts You can check out all the fantastic items made available on the link there. Thanks again for your continued support and not giving up on the Coven of Crones blog. I appreciate you all sticking it out with me through this difficult time of my life. Very soon, I will be creating wonderful witches to add to the family coven. Have a great evening! A Very Special Thank You!!! As always, there are many things to be "thankful" for through out the year, but Thanksgiving is a special time of the year that we show our gratitude for the abundances we have in our lives. 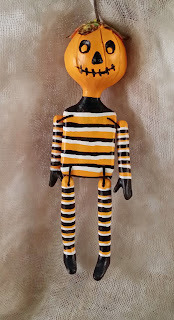 This year, I want to say a special Thank You to all of you out there in the world who have been supportive of my artistic endeavors in the doll and figurative arts. In doing so, I have created a special sale in my Etsy store for this Holiday weekend to show my gratitude for your continued support. As a special note, I also do lay-away plans as well. You can break the payments up into 2 or 3 installments. As always, thanks for following along here at the Coven of Crones (a.k.a. The Pixie Knoll)! 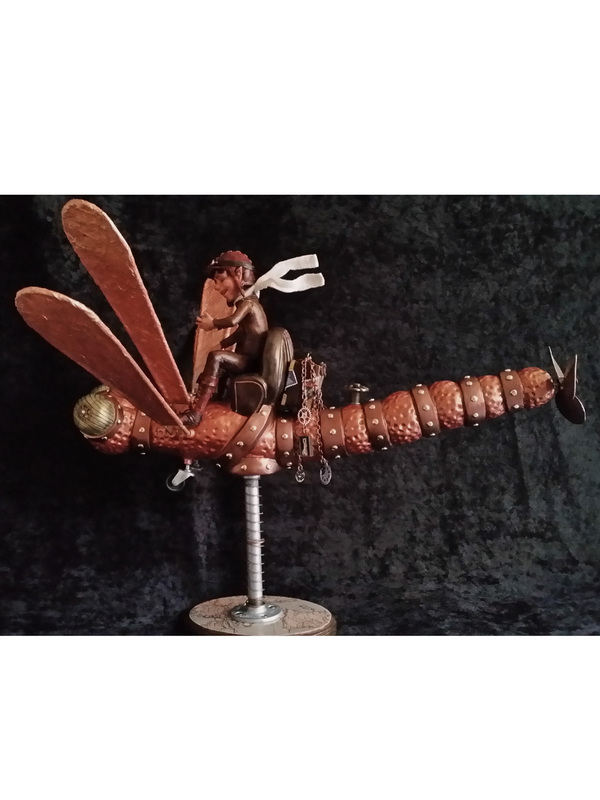 My other blog with fun pixies! 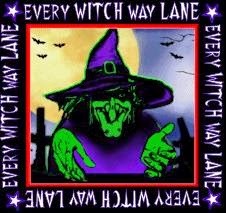 Click here to go directly to the Every Witch Way Lane Store! A shop designed specifically for the Halloween enthusiast and collector!